Welcome to our Holiday Countdown series! While the vast majority of us don’t even want to start thinking about Christmas lights until the first snowfall, for those of us in the online store world ‘tis the season to start planning. Like, yesterday. The National Retail Federation reported that for some retailers, the holiday season can account for as much of 30% of the stores’ annual sales.We want your shop to be all prepped for the upcoming holiday shopping season by helping you plan ahead! It’s always weird to watch the holiday episode of a TV show knowing that they had to film it months before the holidays. After all, who wants to get in the holiday spirit or even listen to holiday music until after Thanksgiving? But while it may seem early to start thinking about the holidays, for bloggers, influencers, and online shop owners like you, thinking ahead and embracing the holiday spirit months ahead of time is necessary if you want to have a successful shopping season. And one great way of getting your products noticed is getting featured in a gift guide or making your own! This takes some planning ahead, so here are some tips on how to get featured in a gift guide, as well as some ideas for how to make your own. Welcome to the gift guide guide! Why are gift guides a big deal? Semi-gone are the days of dog-earing catalog pages or circling items you want for the holidays. Now, most people look online to at least get gift ideas. In 2014, an NRF and shop.org survey reported that 56% of holiday shoppers were planning to do some – if not all – of their holiday shopping online. We did a gift guide page on Threadless last year; our ‘low priced gift guide’ page alone got almost 6,000 views between November 18th and December 31st. Themed gift guides are like hubs from trusted sources of gift ideas; when you can get featured in a gift guide made by a trusted source or make a solid gift guide that gives customers a little something extra, you can seriously grow your audience and your profits. One of the factors that the founder of Shhhower cap mentions regarding how her product was chosen to be featured in a prominent gift guide is due to the photos. She did a full photoshoot to create the Shhhower Cap lookbook. Her product and company were at start-up level, but her photos gave the product even more of a high-end look. Photos can easily make or break your product – a really amazing photo can act as a foot in the door when you’re reaching out to sites, bloggers, etc. for them to feature you, and also to customers. Feature your most giftable products (and make sure you’ve added super giftable items to your shop if you haven’t already!) Stocking stuffers are perfect to emphasize, and be sure to think about what accessories might be treading, like phone cases now that the iPhone X is just around the corner. It doesn’t do you or the influencer any good to show off a product that doesn’t resonate with their readership, so be sure to do your research first! This will also help guide how you pitch those items; it never hurts to include actual content ideas to go along with your product. Suggest your items as great gifts for under $25 for Secret Santa buyers, for the geek/musician/activist family member, or if you’re pitching to a site that values charities and you have a charity tee, mention that it gives to a good cause that their audience might connect with. Get to know the site you’re pitching to and cater the content and the designs you’re sending along to the outlet you’re reaching out to. It helps to look back at previous gift guides they’ve done, what they look for, and what they feature. Knowing what a site is all about will help you figure out what items and gift guide ideas to pitch and, of course, what not to pitch. Also, when you’re reaching out to a specific blogger, there’s usually just one person to reach out to. But for larger publications or sites, chances are the head honcho is insanely busy and might not even be the main person looking for content. Try reaching out to contributors or the editors of a site – they’re looking for good stories to pitch, or can at least get your information to the right people. Here are some tips on how to reach out to writers, bloggers, and influencers! Find creative ways to re-imagine your products for certain sites! For example, do you have toddler tees and baby onesies added to your shop? 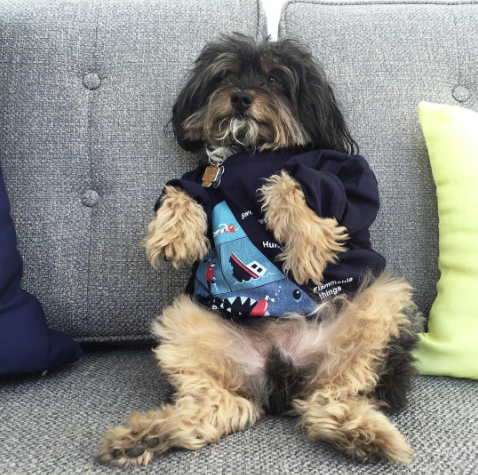 If you do, don’t just pitch them as toddler clothes – pitch them as tees for dogs. Seriously. Our baby and toddler apparel also happen to be the perfect size for small dogs. Getting baby clothes for your dog is a unique and cute angle that a site with a dog-lover’s audience would appreciate! One of our office dogs, Bandit, rocking a baby onesie (via Instagram). Another way you can reach out to influencers is to reach out and ask if they’d be willing to curate a list of their top picks from your shop. This is super hand’s off for them – it can be as simple as them picking three products and allowing permission for you to mention on social media that “these are @so-and-so’s top picks from my shop!”, or you can ask them if they’d be willing to provide a blurb about each of the product picks. 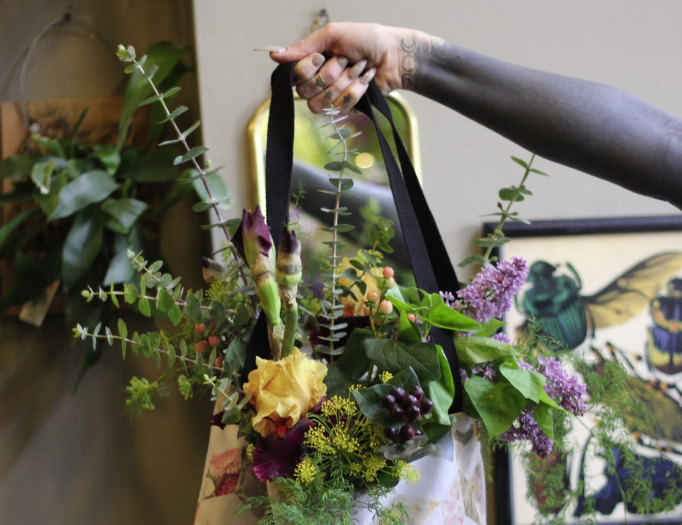 When we did a feature on a super cool Chicago flower shop called Asrai Garden, near the end of the post we asked the owner to pick her favorite floral Threadless design and tell us why she dug it. That way, she’s featured in a non-salesy post that is all about her store and gets publicity, but we can still include our products in the interview, both in photos and through her recommendation. We also brought products with floral designs to feature in photos of the shop and her amazing flowers! Another approach you can take is to pitch an article idea to an influencer – like curating a gallery wall of prints that would make great gift ideas – and offer to send them products to use. 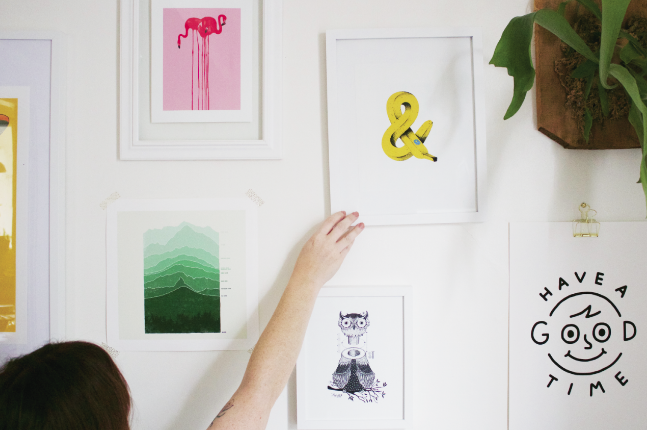 We reached out to Chicago blog Foxtail and Moss and asked them if they’d be willing to create a “How to Create a Gallery Wall” post for our blog using prints of their choice that we sent them for free in exchange. One of the amazing photos Foxtail and Moss took in the guest blog post they wrote for us. Making a list of influencers – Instagrammers, bloggers, writers, contributors, youtube personalities, etc. – who you want to reach out to is a great way of getting organized so that you can tailor each pitch and each product choice specifically to them. Creating your own gift guide is great for your customers, to use in pitches, and can be a great way of directing your customers’ attention to the products they should be looking at and honing their focus a little. Pro tip: remember to actually link photos in it or the post to your shop and/or items – it might seem like a simple thing, but you want to make it as quick and easy for people to get to your shop to, well, shop as possible. Whether you’re pitching gift guide ideas to publications or making your own, it’s key to give it a theme! Think “Secret Santa Gifts Under $25”, “Presents for the Dog Lover (That They Can Match With Their Dog)”, “Gifts to Shut Down Family Arguments During the Holidays” – get creative! That Threadless gift guide page I mentioned was themed by price point – it was a page of all of our low-priced gift-friendly items, and that was a great way to direct the focus of people who were specifically shopping for stocking stuffers. Check out Tech Crunch’s gift guide themes for some inspiration. Also, consider getting imaginative with photography and showing off how your items can be gifted; create a how-to gift guide! Bundling hot cocoa packets in mugs, stuffing zip pouches with art supplies, etc. Create an email newsletter for your customers and make the email itself a gift guide! Or tease the gift guide and make it a “click here in this email to see the rest!” situation. Mailchimp has a really solid free version that allows you to make awesome email templates super easily. Go a step further than just sharing your guide and products on social media. Utilize special features; use Instagram and Facebook carousels to create a unique gift guide. Use Instagram and Facebook stories to advertise sales and promotions. Pinterest is actually an ideal social media outlet to use for gift guides since you can buy a product without ever leaving Pinterest. Helpful tip: pins that include prices on the image are 16% more likely to get likes than those with no prices. Try playing around with Pinterest to create fun gift guides and posts! You should definitely be planning on doing this anyways for the holidays, but this is a great thing to mention in any gift guides you make (or ones you’re featured in) – people love sales. Include details about any sales and promotions you have going on for the holidays – free shipping (stay tuned for November free shipping for your Artist Shop! ), lowered prices, etc. Combine your own post with all the benefits that go along with working with an influencer by guest contributing a gift guide post to a blog, site, etc.! Tip: don’t pitch a gift guide that is made up of JUST your products. Mix it up and include cool products from other sites that are related to your gift guide’s theme and sneak your own relevant products/designs in there as well – that way it’s less self-serving and more of a guide for readers, as well as valuable content for whoever you’re pitching to. Homepage collection photography: order your own items at the low base cost and take some new, holiday-centric photos for your homepage collection (think blankets, mugs, sweatshirts – cozy products for the holiday season!) to get people in the shopping zone. Custom cover image: Get your cover photos ready by adding free shipping codes to them, a note about your holiday pricing, or mention that you have a gift guide (and mention where it lives). About Page: Make sure you have an About page going! This is great for SEO, but if you DO have a gift guide, your About page is where you can include links to your social media, site, and places where that gift guide lives. Look ahead: Prepare for upcoming holidays, important dates, and even fun mini holidays so that you can prep your sales beforehand. Featured illustration by Katie Lukes. Feeling inspired? Try Artist Shops for free! Previous post Your Shop Could be Featured! Next post 8 Habits Every Creative Should Have: An Illustrated Guide!